It's that time of year! And if I'm being completely honest, the holidays kinda get me down. My mom passed away just before Thanksgiving in 2010, and things just aren't the same. But this year I was determined to get myself out of this ba-humpug state of mind and at least get a new tree and ornaments. And I'm not talking about the typical Christmas tree with lots of red and green and tinsel all over- oh no! Check out my five Christmas tree ideas and start decorating your tree with style and a bit of your own personality! I don't know about you, but December is crazy! I'm normally finishing up client projects, buying presents, visiting friends, and basically running around like mad. So I like to save as much time as possible. And while I love the smell of a fresh Christmas tree in the house, it's not practical. If you're feeling the stress of the season, I highly recommend a fake tree that is already lit. You'll not only save loads of time each year, but your tree will be evenly lit and look more put together! Check out my favorite picks below. And while we're on the subject of saving time, can we also talk about the Christmas clutter? I hate clutter of any kind, even if it's sparkly and bright. Please, please, please take a moment and get rid of any old decorations that you no longer want. You'll only have to do it once every few years, but it will save you time every year when you're getting everything out and give you much more storage space. And who doesn't want more storage space? That's my gift to you. I feel like Santa! MY TOP FIVE CHRISTMAS TREE IDEAS: #2 MIX UP YOUR COLORS! Who said Christmas has to be red and green? With plaid? And tinsel? And Santa everywhere? If that's your style then rock it! But if it's not (which is probably why you're reading this!) mix up your colors. Check out these color tips if you want to switch things up this year. Ya wanna know what is basically the cooler, chicer little sister of red and green? Pink and sea foam! And I love some pink and sea foam! So if you want a preppy, upbeat look, this is your way to go! Looking for something chic and sophisticated? Get rid of the color all together! Color schemes can include gold, silver, and white for a light look, or add in some black for more drama! Want to create a winter wonderland? Choose varying shades of blue with white and silver- maybe some copper for a modern look. Here's what I got for my new tree this year as well as some of my other favorites- so much fun and still Christmas appropriate. MY TOP FIVE CHRISTMAS TREE IDEAS: #3 LAYER ON THE BASICS! Place all of one color first with the goal of spreading it out evenly throughout the tree. Then add the next color, and the next, etc. Make sure you have small, medium, and large sizes so your tree has some breathing room and accent pieces. Mix up your textures- mercury glass, matte metallic, milk glass, glitter. The more texture, the more rich and intentional your tree will look. 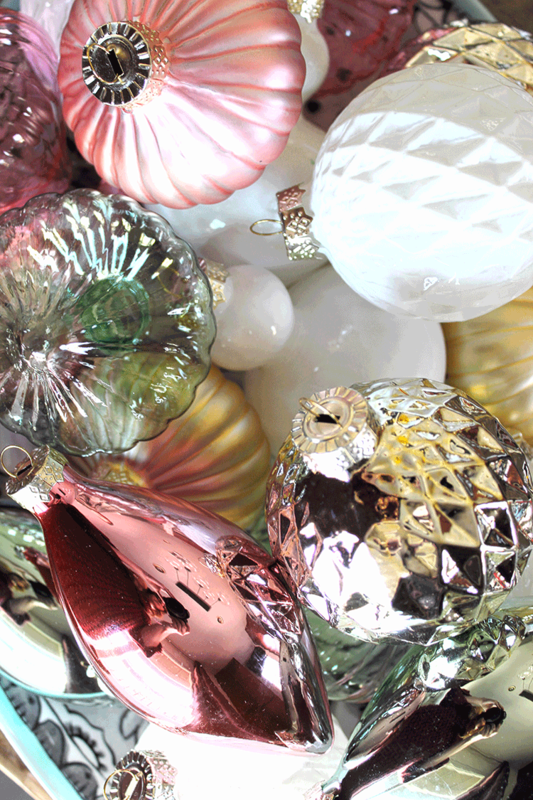 Check out these ornaments with varying textures for some ideas. MY TOP FIVE CHRISTMAS TREE IDEAS: #4 HAVE SOME FUN! No, you may not win a Martha Stewart Christmas decorating contest, but that's not what the holidays are about. And if you want your tree to be unique and not what everyone else is doing, then have some fun! Find some ornaments that show off your personality, your likes, your passions. My husband is a huge (and I mean huge) SciFi and comic fan, and our tree is filled with droids, the TARDIS, a dalek, and countless other super heroes. And to be honest- I love it. Those ornaments bring me joy because they are absolutely my husband- my #1 person! For me, I love macarons, champagne, owls, and peacocks. Yep- they're on the tree. I also have collected every Snoopy signature series ornament from Hallmark since 2000. Needless to say, they have their own tree. MY TOP FIVE CHRISTMAS TREE IDEAS: #5 TOP IT (AND SKIRT IT) RIGHT! We're talking proportion. You would never wear clunky boots with skinny jeans (at least I hope you wouldn't), so you shouldn't put a hug tree topper and an extra wide skirt with a narrow tree and vice versa. If you have a full tree, go for a larger skirt and topper. My tree is probably only two feet wide at the base, so I ordered a skirt that is only four feet wide. A five foot wide skirt would be overwhelming. Same goes for the topper- the tree shouldn't look like it's going to fall over. Now your ready to pour some eggnog, mull that wine, and twinkle those lights! Follow my top five Christmas tree ideas and start decorating a holiday season that is all you! What are your favorite Christmas tree ideas? Comment below!